Les Trois Petits Cochons, the Three Little Pigs, has produced award-winning, all natural pate and charcuterie (cold cuts) since 1975 by crafting small, handmade batches using high-quality ingredients. 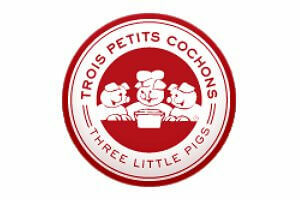 Les Trois Petits Cochons began as a small charcuterie in Greenwich Village, New York City. Les Trois Petits Cochons is committed to continuing the tradition of making delicious, authentic and quality pate and charcuterie, by combining time-honored recipes, choice ingredients, innovative cooking methods and strict quality control. Today it leads the pate and charcuterie industry, offering a complete line of artisanal pates, mousses, terrines, sausages, saucissons, smoked meats and other French specialties. This Duck Liver Mousse with Port Wine or Mousse de Foie de Canard au Porto is a creamy smooth duck liver pate with pork and Port wine. Les Trois Petits Cochons, the three little pigs, have been producing all-natural pates, in small handmade batches, using high quality ingredients since 1975. No artificial ingredients are added and the mousse is minimally processed. A fruit red wine or a dry white wine will pair well with this duck mousse. A crusty bread and some jelly and you're all set.